While bitter cold has blanketed some parts of the country so far this winter, many fathers trying to save money are looking for ways to cut down on their heating bills and still keep their families warm. Experts say changing the filter in your furnace is a quick and easy money-saving tip since a clean filter makes your heater run more efficiently. There are different types available, including disposable filters and reusuable ones that can be regularly cleaned. 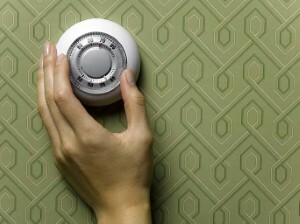 If you don’t have a programmable thermostat for your home, now may be the time to consider one. These help ensure you turn the heat down when you’re not at home or sleeping. An added bonus is that you’ll come home or wake up to a house that’s already warmed up! Some money-saving experts say fathers should take advantage of the sun to help heat their homes during the colder months. Make sure window shades and curtains are opened during the day to let the light and warmth in, but make sure to close them when the sun goes down to keep the heat in. Drafty windows can be temporarily insulated using do-it-yourself kits from the hardware store, too. You may not think running a ceiling fan during the winter will help with heating the house, but remember that heat rises and keeping your fans on low will ensure heat doesn’t just get trapped above you.